who melts in my mouth. My margarine life is over, thanks to you. I’ve never been betterly, butterly one. there before me! I’m toast. but butterly shall we go. This poem first appeared in Free Lunch. 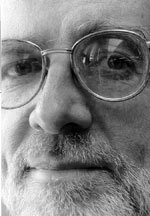 Philip Dacey (1939 - 2016) authored fourteen books and published hundreds of poems in journals and magazines. After teaching for 34 years at Southwest Minnesota State University, he moved to New York City for a post-retirement adventure on Manhattan’s Upper West Side. Eight years later, having accomplished all his intended goals there, Philip returned to Minnesota to live in the Lake District of Minneapolis with his partner, the poet Alixa Doom. Learn more about Philip at www.philipdacey.com. I love this clever word play. I laughed out loud. Haven't read a butter poem in ages. I really love this poem. It's so playful. You never disappoint me. I love it! Beautifully written. Not exactly a mondegreen, but in the same family, I feel. I've been a fan of Phillip Dacey's poetry since "Mystery Baseball" with the marvelous line, "One man rounds third base, pumping hard, / and is never seen again." This poem is SO Phillip Dacey! Everything he writes is fantastic, such a treat for every bit of consciousness and emotion. If the sparkle in someone's eyes could be written, this is how to do it. I guess poems are the errors that our better (butter?) selves aren't inclined to correct. love butter and this poem--thanks! There is, in this country where I live, a brand of 'spread' called 'Utterly Butterly' which I will now for obvious reasons never look at again without a smile and a guffaw. I dare not for some little time visit my local supermarket for fear of being arrested for holding up a pack from the chiller cabinet and laughing hysterically. Thanks for this! i love the whimsy and intelligent playfulness of this poem! A delight to read.